On November 27, 2018, about 1230 Alaska standard time, a Cessna 172 airplane, N7207A, was destroyed during a forced landing and postcrash fire following a total loss of engine power shortly after departure from an off-airport landing site on Montague Island about 60 miles east of Seward, Alaska. The student pilot and one passenger sustained minor injuries. The airplane was registered to and operated by the pilot as a 14 Code of Federal Regulations Part 91 visual flight rules (VFR) flight. Visual meteorological conditions prevailed, and no flight plan had been filed. According to the pilot, on a previous flight the same day, while on final approach to the off-airport landing site on Montague Island the engine lost all power. He applied carburetor heat and was able to restart the engine and landed uneventfully. Following the event, the pilot sumped the fuel system and removed 7 vials of water. He then taxied for departure and completed a run-up. The engine continued to run rough for a short period of time, then began to smooth out with no anomalies noted. Just after departure from the off-airport landing site, at about 30 ft above ground level, the engine lost all power. The airplane impacted Alder trees off the departure end of the airstrip and was destroyed by postcrash fire. The aircraft was equipped with a Continental Motors O-300 series engine. A detailed wreckage examination is pending. Airmen of the 176th Wing launch a 210th Rescue Squadron HH-60G Pave Hawk on Monday, Nov. 27, 2018, at Joint Base Elmendorf-Richardson, Alaska. The HH-60 pictured here was recalled when pararescuemen of the 212th Rescue Squadron earlier deployed with another HH-60 crew and rescued a pilot and a passenger of a Cessna 172 that crashed on Montague Island. The Alaska Air National Guard rescued a pilot and passenger after their Cessna 172 crashed on Montague Island on Tuesday and then caught fire. The crash occurred on takeoff around 12:30 p.m. Tuesday, federal investigators say. The pilot, who was not identified, reported partial loss of engine power before crashing into a stand of trees. Both occupants received minor injuries, National Transportation Safety Board Alaska chief Clint Johnson said. The post-crash fire “incinerated” the plane, Johnson said. The agency is investigating the crash. The crash occurred on the southwest part of the island in the Gulf of Alaska at the entrance to Prince William Sound, according to a Guard press release. The Guard responded after the Rescue Coordination Center picked up the signal from an emergency locator transmitter beacon. Shortly after the center received the signal, it stopped broadcasting — because the plane caught fire, authorities say. The crash survivors, however, grabbed their tent before it burned, according to the Guard. They used it to take shelter from the rain. The pilot had called family members on a satellite phone to update them, and his relatives called the U.S. Coast Guard, who relayed the information to the rescue coordination center. Bad weather initially stymied a Pave Hawk helicopter trying to get to the crash site by way of Moose Pass, the Guard said. 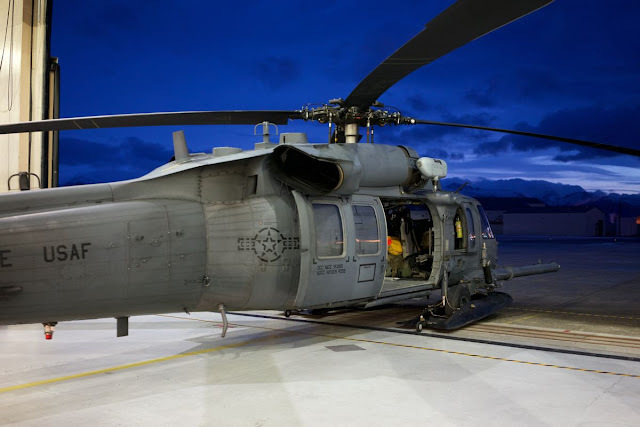 Another Pave Hawk was launched to try a different route, but the first helicopter refueled in Seward and navigated to the crash site along the coastline. The helicopter flew the pilot and passenger to Providence Alaska Medical Center. Their identities and medical condition weren’t immediately available. JOINT BASE ELMENDORF-RICHARDSON, Alaska — Airmen with the Alaska Air National Guard’s 210th, 211th and 212th Rescue Squadrons rescued a pilot and a passenger of a Cessna 172 that crashed November 27th on takeoff from southwest Montague Island. According to Alaska Air National Guard Staff Sgt. Jeremy Rhodes, Alaska Rescue Coordination Center, the mission was opened in response to the receipt of a 406 Emergency Locator Transmitter beacon signal. An HH-60G Pave Hawk helicopter from the 210th Rescue Squadron and an HC-130J Combat King II from the 211th Squadron launched from Joint Base Elmendorf-Richardson. Aboard the helicopter were pararescuemen who are highly trained personnel specializing in rescue operations. Shortly after the ELT signal was received, it stopped broadcasting because the plane caught fire and burned. The pilot used a satellite phone to call his family who, in turn, called the U.S. Coast Guard 17th District. The Coast Guard relayed the information to the AK RCC. Before the aircraft burned, the survivors managed to retrieve their tent, and they set it up as shelter from the rain. Initially, the HH-60 crew had difficulty getting to the crash site via Moose Pass due to inclement weather. Another HH-60 was launched to try a different route. The first HH-60 refueled in Seward before successfully navigating along the Kenai Peninsula coastline to the crash site. The helicopter landed and the pararescuemen rescued the individuals. The second HH-60 returned to JBER shortly after launch. The HC-130 provided mission control and communications relay between the helicopter and the AK RCC. The pilot and passenger were flown to Providence Alaska Medical Center’s rooftop helipad and released to hospital personnel. Alaska Air National Guard Maj. Andrew Williams, AK RCC deputy director, said it was a credit to the pilot he had two means of notifying authorities after the crash: the plane’s onboard ELT and his satellite phone. Williams stressed the importance of registering ELTs to ensure officials have the most up-to-date information. Two injured men were rescued Tuesday night after their small plane crashed and began to burn on the southwest corner of Montague Island. The Cessna 172 went down shortly after takeoff, according to Alaska Air National Guard officials. After the crash, the men were able to hunker down in a tent with some supplies and wait for help to arrive. "The plane's [emergency locator transmitter] went off after it crashed," said David Bedard, a spokesman for the Guard's 176th Wing. "They also had a satellite phone and were able to call family members for help." Relatives of the men called the U.S. Coast Guard, which then asked the Guard for help conducting the rescue. "It's a lot of coordination between the different units," said Tech. Sgt. Robin O'Brien, with the Guard's 210th Rescue Squadron. "The 210th is the helicopter unit, the 211th is the HC-130 unit and the 212th is the pararescue unit and we all work together to make it happen." An HH-60 Pave Hawk helicopter from Anchorage's Joint Base Elmendorf-Richardson was able to maneuver through poor weather in Moose Path and along the coast to find the stranded men and land on the island. "We hadn't had a call in about four weeks," O'Brien said. "When a alert comes in, we always have to be ready." The two men were taken to Providence Alaska Medical Center for treatment of minor injuries, Bedard said. A second Pave Hawk helicopter was also dispatched, but quickly recalled after it was notified the first crew was able to rescue the men. I thought Alaskan downed pilots just lassoed a Polar Bear and rode them to safety.